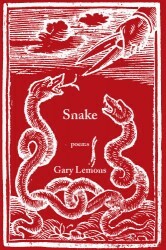 Last Wednesday the Butte College Reading Series welcomed poet Gary Lemons, who is touring California promoting his new collection of poetry titled Snake (Red Hen Press). Despite having less than favorable weather conditions and this reading overlapping with Game 1 of the World Series, we had quite a turnout. Gary started by talking about his background and the different jobs he’s held throughout his life. At one point he was working on a fishing boat as a slimer in hopes of becoming a welder. This particular ship was originally used by the Navy during World War II to transport the bodies of dead American soldiers. Now, the three-floor freezer that once kept the bodies of fallen soldiers from rotting was used to store fish. Working in this haunted place inspired the 25-page Homer-esque poem that is the centerpiece of Lemons’ collection Bristol Bay. Gary read several sections from this poem, which recounted feeling the souls of those men and how eerie, quiet, and still it was. Lemons read two other poems from Bristol Bay, “Voodoo Economics” and “In Memory of Nadia Anjuman, 1980-2005.” The first Gary wrote as a cautionary reminder to himself to not become the thing he is fighting against. The second honors a 20-year-old Afghan woman who was stoned to death for writing poetry. Both were beautiful and the left the room in silent contemplation. Then Gary shifted into poems from his new book, Snake. If you were unable to attend Wednesday’s reading, I would recommend trying to catch Lemons reading at some other location. Snake is a collection whose poems need to heard, not read. The only creature left on earth, Snake, who is the speaker throughout the book, is a minimalist and speaks in a way that expresses this. The poems have a certain tempo that makes them an absolute delight to hear. As he read poems from Snake, some attendees who were following along with the book noticed he was editing as he read, leaving out a line or word here, adding something there. He said he does this because poetry is alive, always changing and developing. The poems from Snake deal with the issues we are currently facing in politics, consumerism, and the natural world around us. Gary said he is still trying to find all the meaning in each of them. Because they just came to him, he still isn’t conscious of all the messages being transmitted, he just knew they had to be written down. Intense. Gary read the full poem in the language in which he originally heard it and then read the English poem. The audience was absolutely blown away and requested an encore reading, which did not disappoint. This was by far one of the best readings I have been to; Gary is amazing man, and it was a honor to hear him read his work. I highly recommend purchasing one of his books of poetry, and if you ever have the chance to hear him read do not let his words pass you up.